A sea-change appears to be taking place on both sides of the Atlantic as the centres of traditional capitals, London and New York, become uninhabitable to many save the mega-rich. In the UK the dazzling new Birmingham Library is emblematic of an important shift away from the primacy and architectural literalness of the British Library, with its lynchpin King’s Collection and predictably pensive Paolozzi, towards a wider, more enlightened and airier conception of ways to disseminate knowledge. 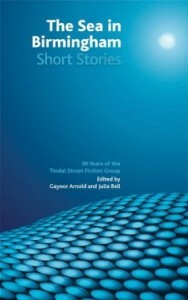 To celebrate the city’s new Literary Festival (October 2013), one of its most respected and experienced collectives, the Tindal Street Fiction Group, publishes an equally brilliant selection of short stories reflecting the power and fluency of this change, as cosmopolitan Midland writers portray the centrality of place in creating social identity and meaning. The writing is consistently strong and widely varied, reflecting the experiences and styles of an extensive network from all walks and stations of life. A watery theme links several, as though the sea were indeed both metaphorically as well as physically inching inland. Julia Bell’s subtle ‘Go To Sleep, Lobster’ offers a modern-day fairy tale in which one seemingly pointless yet authentic good deed shines like sunlight on a naughty world of phoneyness and falsity. In ‘Adult Beginners’, Gaynor Arnold’s sensitive portrayal of the courage necessary to overcome phobia, she uses the experience of a boy whose mother drowned herself and nearly took him with her. It has the ring of icy, terrified truth and ends by confirming amor vincit omnia. In ‘Mr Spider’, Mez Packer’s equally brave and loyal tyke of a younger brother speaks most of the time in an unmistakably genuine, violent vernacular. Interestingly, his and the narrator’s ear for nursery cadences tend toward the tin, reflecting their mutual wariness of bonding, even in singsong. A telling touch. These stories are just a quarter of sixteen highly revelatory examples in this beautifully edited collection. A fifth is the remarkable debut work of Anthony Ferner: ‘The Cat It Is That Dies, Perhaps’. This is a moving work of pointillism suggesting the cumulative value of shared points in time and space within mature marriage. Initially elegiac, it develops, through rich humour – ‘I’m going to kill this farshtinkener cat one of these days’ – into a series of distillations which together form the stuff of everyday common yet idiosyncratic experience. Simone Weil said that it is not so much what every moment of a human life contains as the way in which each of its moments is connected. This book offers an insight into how Midland writers, in this instance over thirty years, create and develop a sense of solidarity within both an area and a discipline. The dots join up and make a gorgeous whole – well worth reading and emulating.